See the new 2018 Toyota Camry at your local Louisville, KY Toyota dealership. View 2018 Toyota Camry Inventory Get a Quote! It’s finally here! The refreshed and reinvigorated 2018 Toyota Camry has hit our lot at Oxmoor Toyota in Louisville, Kentucky. 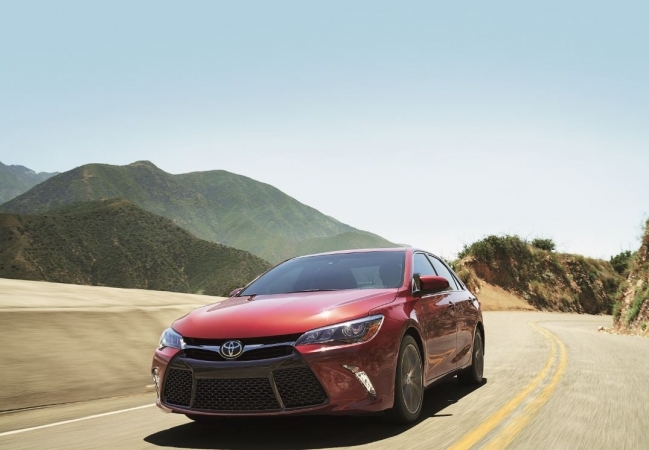 One of the Toyota lineup’s premier vehicles, the latest and greatest Camry is sportier than ever, with a striking black sport mesh grille, and available leather-trimmed 8-way driver’s and front passenger seats. Typically innovative, the standard Toyota Safety SenseTM package provides the ultimate feeling in confidence and peace of mind when you take to the streets. Surprising performance and technology abound in the 2018 Toyota Camry, complete with an available Brid’s Eye View Camera with Perimeter Scan. You’ll just have to see this sedan for yourself. Be one of the first in Louisville to try out the 2018 Toyota Camry when you take a test drive with Oxmoor Toyota! Why Us? For all the innovation that Toyota has to offer, Oxmoor Toyota in Louisville, KY is your go-to dealership destination. Our friendly and knowledgeable sales associates understand the ins and outs of the 2018 Toyota Camry and absolutely cannot wait to show this model off. Moreover, we will walk you through every step of the car buying process in a smooth and easy manner, answering any and all questions about loans, leasing, financing, and more. If you ever need assistance after you drive off our lot, the Oxmoor Toyota service center is ready and waiting to take care of all of your Toyota needs. Contact us today to see the 2018 Toyota Camry in person at our Louisville Toyota dealership! Ready to learn even more about the 2018 Toyota Camry? Watch our hands-on sneak preview video, where Chuck will walk you through the highlights that make this model so exciting. From changes in body style, to technology, to performance, let Oxmoor Toyota show you why the latest Toyota Camry is worth the extra look. If you have any further questions, reach out to us today!